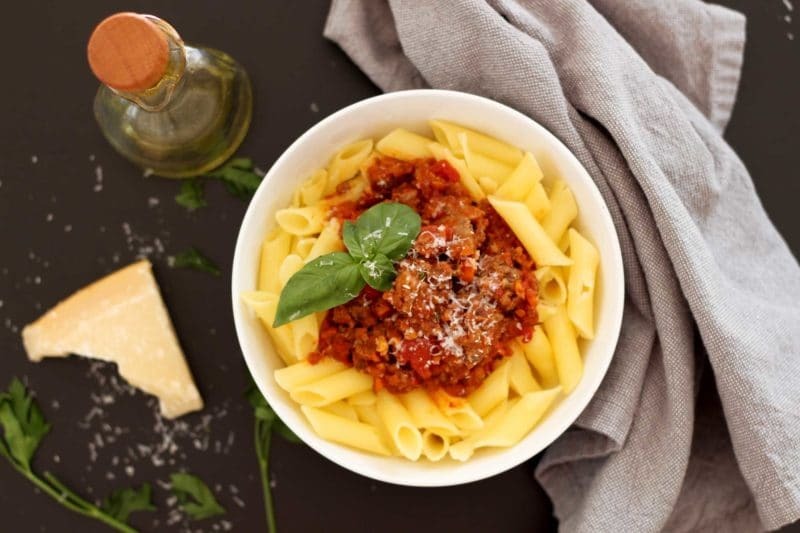 This Penne Pasta with Italian Marinara Sauce really hits home if you are looking for homemade comfort food. This sauce is full of so many Italian herbs and spices! The fresh oregano, basil and Italian parsley pairs so well with the zangy tomatoes, fresh minced garlic and onions! Everyone in your family will rave over this pasta dish! I love a good pasta dish! I could live on pasta and be just fine! I mentioned in some of my past posts that I often travel for work. I do travel internationally and I just got home from England 4 days ago! I’m still jet lagging, but I love it over in the UK…there is so much history, culture, diversity and it’s just beautiful! Whenever I travel, the TV station stays on Food Network. I watch a lot of Food Network when I’m home, but having it on in the background when I travel just really helps me feel more at home and comfortable. Maybe that’s weird…I don’t know but it makes me feel better! Since the UK is 8 hours ahead of me here in Arizona, whenever I would wake up to get ready for work the same shows would be on. It was always The Pioneer Woman and Barefoot Contessa…which is perfect because those are two of my favorites! While The Pioneer Woman was on one morning, Ree was making her marinara sauce for her family and my mouth instantly started watering! Oh man! I started craving pasta with marinara! Lucky for me, there was an amazing authentic Italian restaurant right down the street from my hotel so I took care of that craving immediately, but it made me want to venture out and try making a new type of marinara sauce. I have two other marinara sauces on my website that are fantastic! 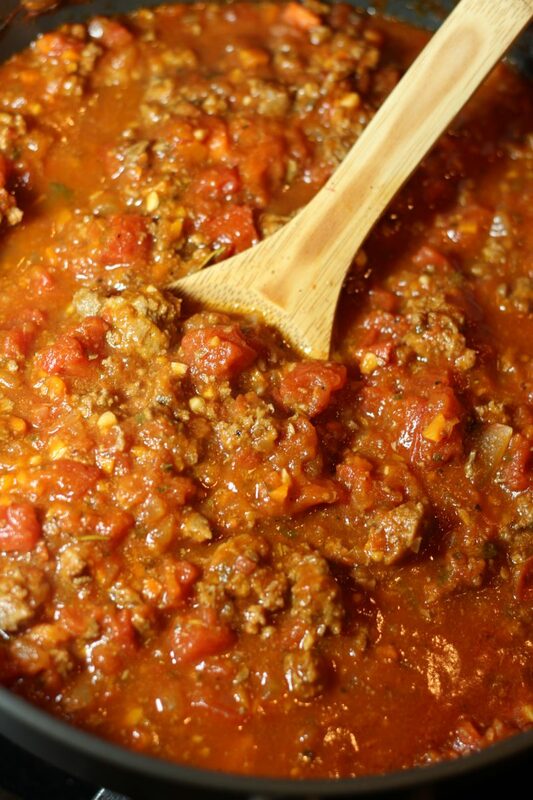 My Homemade Spaghetti Sauce is amazing…it’s been in my family for over 40 years. I also have a really great authentic Italian Marinara with Meatballs recipe that came from my really good friend, Lindsay’s Italian grandmother and it’s to die for! But because I love to explore with recipes and ingredients, I wanted to try making a new one! So what did I do? I looked at Ree’s Marinara Sauce for ideas and revamped it a bit to fit my taste. Ok, look at this sauce below. Is your mouth watering yet? It should be! There is one ingredient in Ree’s recipe that I wanted to ensure I kept in and can you guess what it is? Carrots!!! Can you believe it? I was a little leary on leaving the carrots, but my son loves carrots so I thought, what the heck…let’s go for it! And it turned out so amazing! So let me talk about this marinara sauce I created for this Penne Pasta with Italian Marinara Sauce. I used ground beef in my marinara sauce but next time I’m going to use ground Italian sausage. While my husband was eating this Penne Pasta with Italian Marinara Sauce he asked if I used Italian sausage and I said no. He was like, really? It tastes like it! After thinking about that comment, I just know this sauce will “pop” so much more if I use ground Italian sausage! Ok, back to these ingredients in this marinara sauce…I think the key to this marinara sauce recipe is sauteing the onion, garlic and carrots in olive oil. I always have a flavored olive oil on hand so this time I used a garlic olive oil. If you don’t have a flavored olive oil, don’t worry! Any brand of extra-virgin olive oil will work perfect! The other key to this sauce is using a wide variety of fantastic herbs! I chopped up fresh oregano, Italian parsley and basil and then added in some dried rosemary and thyme. Oh…and one more ingredient….sugar. Yep, sugar is key to a good marinara sauce! When making any marinara sauce, one thing you need is time. Cooking this sauce slow is so important. Don’t rush this one….it’s so worth the wait! 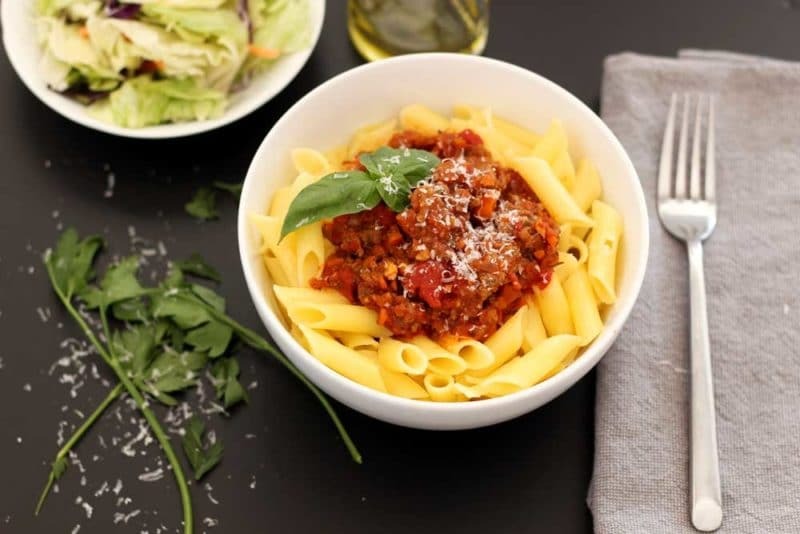 This marinara sauce is gluten free and if you serve this sauce over gluten free noodles, you have yourself a gluten free meal! I used penne pasta, but feel free to use whatever type of pasta you want! I hope everyone enjoys this Penne Pasta with Italian Marinara Sauce! 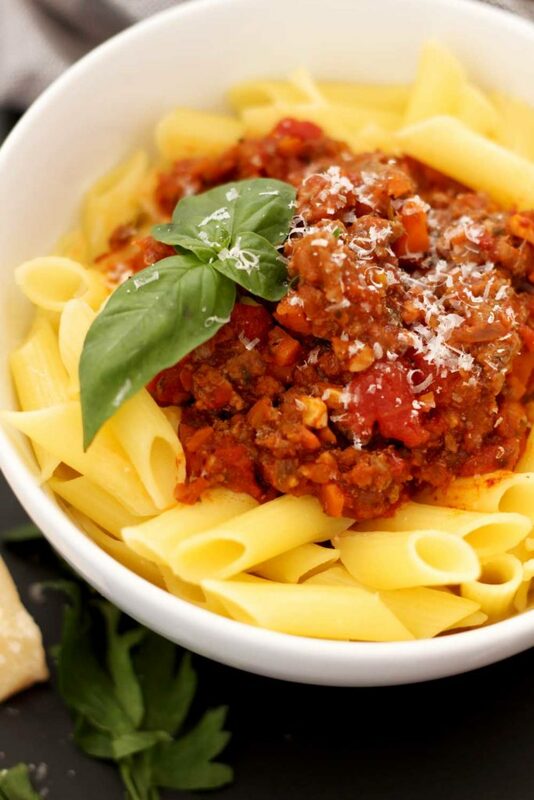 Make sure to top this one off with fresh chopped basil, fresh Parmesan cheese and a nice glass of red wine! Bon Appétit! 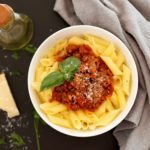 This Penne Pasta with Italian Marinara Sauce really hits home if you are looking for homemade comfort food. This sauce is full of so many Italian herbs and spices! The fresh oregano, basil and Italian parsley pairs so well with the zesty tomatoes, fresh minced garlic and onions! Everyone in your family will rave over this pasta dish! Finely shop the onion, garlic and carrots and place in a bowl. Don't peel the carrots...that's where most of the nutrition is! In a medium pot, heat the olive oil over medium heat. When oil is hot, add in the chopped onion, garlic and carrots and saute for about 5 minutes. While the vegetables are sauteing, pour the 2 cans of whole tomatoes in a bowl and break apart with your hands. You want to release the juices and ensure they tomatoes are broken into smaller pieces. Once the vegetables are done sauteing, add the broken up tomatoes to the pot, along with the can of diced tomatoes. Also add in the water and half the can of tomato paste.Stir well to start mixing all the ingredients together. Add salt, pepper, oregano, thyme, rosemary, basil, sugar and parsley to the sauce and stir well. Bring the sauce to a rolling boil and then reduce the heat to low and simmer uncovered for 90 minutes, stirring occasionally. Once the sauce is close to being done, cook your pasta according to the box directions. 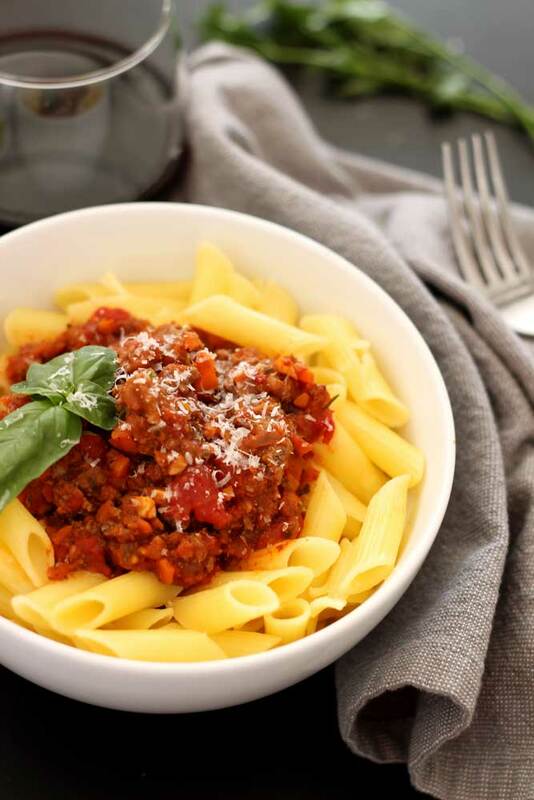 Serve the sauce over the cooked pasta and top with freshly grated Parmesan cheese and fresh basil. Don’t forget to pin this Penne Pasta with Italian Marinara Sauce to your favorite DINNERS, PASTA and GLUTEN FREE boards on Pinterest! I love homemade sauces– so much better than jarred! This looks fantastic. Thanks! Yeah – I try to stay away from jarred – homemade is so much better!! Best food ever! Because who doesn’t love a good bowl of penne with marinara sauce! Yes! This is why I’m trying to add more recipes with marinara sauce! This looks so good.. there’s nothing better than a big bowl of pasta! I know! It’s the ultimate “comfort food”! This is such a classic comforting Italian dish, isn’t it. The more parmesan the better I say! Yes – such a fab comfort food!! looks like a perfect pasta sauce! big pasta fans here, just made a good meat sauce for dinner last night. Nice! I’m glad you approve! Enjoy! 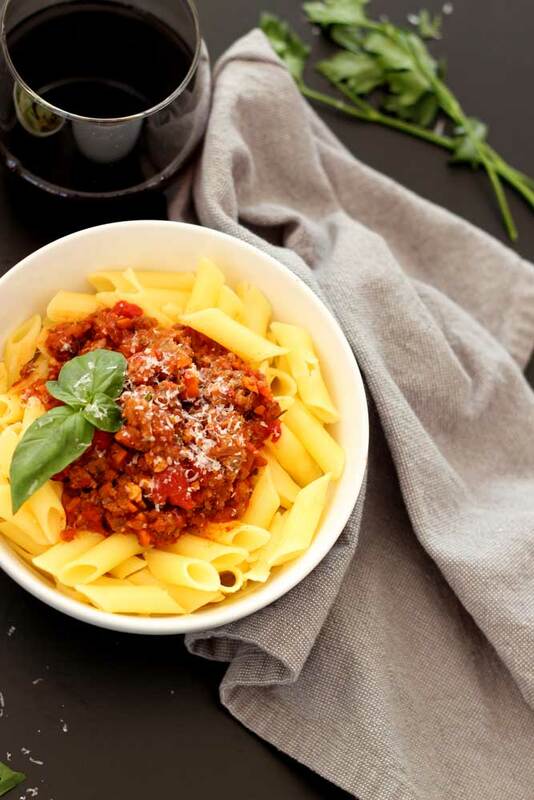 Pasta, a good red sauce and a glass of red wine is one of my favorite comfort meals! Your sauce looks awesome! Going to try it! I hope you enjoy it!! It’s such a savory dish!! This recipe looks warm and inviting. Pasta with homemade marinara is a favorite. Love the simplicity. Thanks! Yes…simple sometimes is best 🙂 Enjoy! Yum! You can’t go wrong with a big bowl of pasta. I watch a ton of Food Network too. It’s one of my go to channels for some company and comfort. Yes! I’m watching it right now actually My TV is glued to that channel! I hope you enjoy this pasta dish!